This is how some people especially the young ones who were told by, ahem, well “someone” that lots of money can be made in the stock markets very fast think like this. Read the WhatsApp message I got in my mobile today and enjoy. Well do you think 30% a year is less? If someone started trading in 1950 (the year Warren Buffett started trading), with just Rs.1000 (one thousand only) and made a modest return of 30% a year, today after 65 years, his investment would be worth Rs. 25,486,951,936.00. (More that Rs.2,500 crores – yes more than Two Thousand Five Hundred Crores). Calculated using this compound calculator. There was another WhatsApp message by a young trader just out of college who told me that “positional trades are boring”. 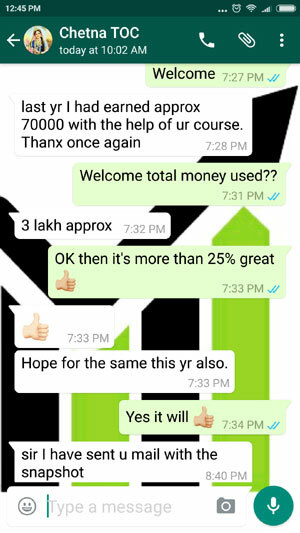 He did not take my course because it teaches positional strategies only. 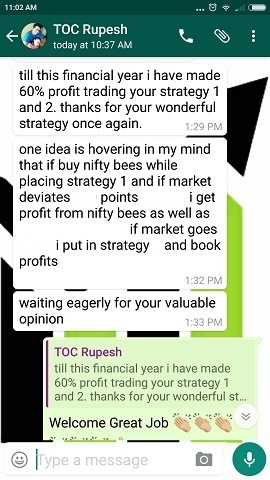 He was only interested in Intraday strategies. Well really? I can bet that at least 5% of positional traders are making money but 99.99% intraday traders are losing – yet the young ones love intraday trading. Agreed, intraday trading is more fun. But we get into trading to make money not to have fun isn’t it? That is one reason why you see thousands of tips providers offering tips on Intraday trading. How many of them offer positional trading tips? I think less than 10%. It is easy to sell Intraday tips, and very hard to sell positional stock options and futures tips. Business goes where money is there. It is a different story what happens after you pay them. 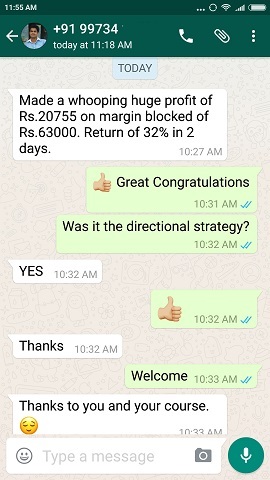 Intraday traders hit the reality once they lose 1 or 2 lakhs. Some are stubborn and end up losing more than 2 crores. Stock market is a business. Just because entry barrier is easy does not mean itâ€™s easy to make money in Stock Markets. On the other hand, those who understand, have the knowledge and discipline to invest, and show patience can grow their wealth over time. The real reason why people lose money in stock markets is that they have huge expectations, they are greedy and they just do not have patience. They all want to get rich in one trade that gets over by the day markets close. How is that even remotely possible? Like the story “slow and steady wins the race” – itâ€™s the same in stock markets. Those who invest slowly, trade with discipline and diversify their risk are the ones who will make money. Those who come with lakhs and risk crores to make crores, lose crores. Stock market is NOT a place for greedy people and people who want to get rich quick. This is one market where rich or poor does not matter. The only thing that matters is the trading strategy. Manage risk, take calculated risk, know where you need to get out of trade and grow your money slowly. And yes compounding is also very important, else you will end up having some fun for years and end up with nothing to show. If you do not compound, even if you are making Rs.100 a day, you still end up making the same amount years from now. Once you get to know the strategy that works for you – just start increasing your trading capital on that strategy. Again slowly – like 1 lot increase every month. Remember one lot is not a small amount – it is going to be more than 5 lakhs from November 2015 once the new lot size comes into effect. Some people think that the margin blocked is the max risk. No its not. When you are taking unlimited risk like trading Futures – you can lose more than the margin blocked. Ask traders who get a margin call. A lot of them got that call when Nifty nosedived by 6% in one day on 24-Aug-2015. That again is a big reminder how hedging your trades is very important if you are leaving them over-night. 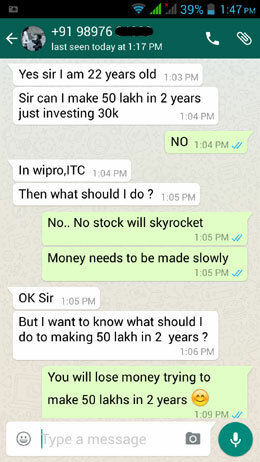 I got a call from a trader the day Nifty fell 6%. 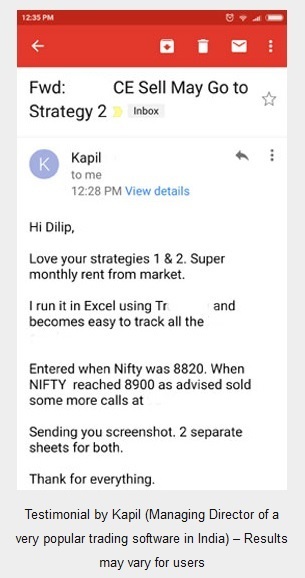 He made 3 lakhs selling naked options in 2 months, and that day was sitting at a loss of 13 lakhs. He got a margin call from his broker and he called me. Tell me how can I help? Of course I cannot give him 10 lakhs. 🙂 Though I gave him an idea, but to be frank he did not contact me after that so I do not know what happened to his trade. The motto of the post is that it is possible to make a lot of money from the stock markets – but you canâ€™t do it by speculating or taking tips from anyone. And also do not expect that you will get rich in a day or even a few months. But you can get rich, very rich, if you are willing to put in efforts and have patience to wait for a few years to make it rich. So, Stop Dreaming – Start Working! 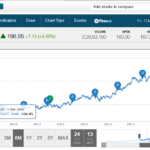 Iam a regular reader of your blog, infact I started trading in nifty options in confidence . I have few points to get clarified from you sir i.e revised lot sizes.Based on SEBI circular the revised lot size will be 75/lot for futures and options. Right now for trading iron condor in options the amount required will be aprrox 30K. Sir can you please tell us in order to trade iron condor in options from November 2015 onwards the money required. Of course I have ZERODHA account. Sir how about trading stock options??? ?then retail traders like us will come out of derivatives market. What is your view on this. The new lot size of Nifty is going to be 75 from November 2015. Since the lot size has tripled you will also need 3 times the money so the margin required will be 90k approx. That being said the returns are also going to increase. However on the flip side the risk will also increase. I quite agree. Speculative trading on Stocks with lot size equivalent to 6-7 or more lakhs will reduce drastically. However I do not think the stocks which will fall in bandwidth of 5-6 lakhs will experience much difference in volumes traded. Frankly the real picture will emerge only in November. I am sure Mr. Shivanand Shankar Mankekar, has not made that money in a day or two. He must have waited for many years patiently. He also must have done thorough research himself and not taken any tips from anyone to invest his money in the share markets. And of course compounded his money. But interestingly what is NOT mentioned there is how much was his investment? This is very important because only then we can calculate the returns he made. It is also interesting to note the end of the article which says, “As to whether an individual with a modest salary can attain to such wealth, experts held it was tough. “Maybe he had inherited a large amount or had land or other assets to start with,” said one broker. Many constituents of the stock market have heard about Mankekar but know little about him. So some money he did made out of speculations – but most of the returns came from constantly investing in the right shares at the right time. But even bigger returns came because he had patience to wait for the profits. At least 5% of positional traders are making money but 99.99% intraday traders are losing. Get into trading to make money not to have fun. Invest slowly, trade with discipline and diversify risk to make money in Stock market. The more i read Ur articles the more i am getting wiser.